Reviews: Poets as heroes in "Paterson," "Neruda"
Two new films honor literature as a life-saving force, presenting poets as heroic protagonists who either wield mighty pens against swords or simply capture some of life’s most intimate moments in passages of carefully-crafted prose. The stories of Jim Jarmusch’s “Paterson” and Pablo Larrain’s “Neruda” (both of which will screen at the New York Film Festival and open in theatres later this year) use poetry to define their central figures, even when society might view them through the prism of their day jobs. 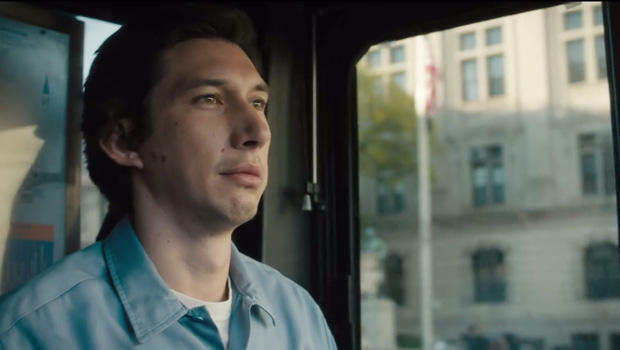 In “Paterson,” set in the titular New Jersey city, Adam Driver plays a bus driver (also named Paterson) who turns phrases over and over in his mind, until he can write them down (in ink and without cross-outs) in his private notebook. His poems are about small, treasured moments in life -- a paean to a matchbox, for example, which turns into a love poem. The poems are just for himself, to the consternation of his wife, Laura (the delightful Golshifteh Farahani), who tries to convince him to have them published. He seems perfectly fine with basking in the pleasures of creation, without worrying about how the outside world might or might not appreciate his work. Laura (whose artistic bent is to decorate their house, and herself, in black-and-white) hopes to get a cupcake business off the ground. But their low-level aspirations snugly fit their small house which they share with an English bulldog. They are just about the most content couple alive. When he isn’t ferrying passengers through working class neighborhoods and downtown shopping districts, Paterson partakes of a beer at a corner bar, where he witnesses chess-playing barflys and a young actor (William Jackson Harper) going through the pains of unrequited love. But these sights and sounds don’t seem to inspire his art. He is much more insular, using words to capture an idea or thought rather than to recreate or refine a view of the world around him. Jarmusch’s 1984 film “Stranger Than Paradise” helped launch the growing independent cinema movement. In his subsequent features, including “Down by Law,” “Mystery Train,” “Night on Earth,” “Dead Man,” “Coffee and Cigarettes” and “Only Lovers Left Alive,” he typically has been drawn to characters who are downtrodden or who inhabit (sometimes gratefully) the outskirts of mainstream society. Their very lives are poetry, after a fashion, commenting upon a world that may not be wholly embracing of them. Paterson lives that creed. But the film offers him a chance to glance beyond his notebook, and to take his words along with him. “Paterson” is a lilting joy. “Paterson,” an Amazon Studios release, will be screened at the New York Film Festival on October 2 and 3, before opening in select theatres December 28. 118 mins. Unlike “Paterson,” the enthralling biofilm “Neruda” is based on real life, being the story of the Chilean poet and Communist statesman Pablo Neruda, who in 1948 publicly denounced his country’s fascistic government. Forced into exile, Neruda continued to write, publishing works that denounced Chile’s leaders, while leaving behind notes that taunted the police hot on his trail. Neruda (Luis Gnecco) is hailed as “a man of mountains and eagles,” for whom literature bears the weight of an entire people. Though given to self-aggrandizement about his talents, he is also political enough to know when and how to deploy them. “To write well, one must know how to erase,” he says, as he drags his artist-wife along, one step ahead of the determined Police Prefect Peluchonneau (Gael García Bernal, of “The Motorcycle Diaries). As Peluchonneau chases Neruda from the streets of Valparaiso to the snow-covered mountains of the Argentine border, and the bordellos in-between, director Pablo Larrain (whose 2012 film about Chilean politics, “No,” was nominated for an Academy Award for Best Foreign Film, and who recently directed Natalie Portman in the Jacqueline Kennedy biopic, “Jackie”) employs a fanciful mix of naturalism and highly-stylized Hollywood tricks, such as rear projection. As stylized as the film’s cinematography may be, Peluchonneau’s psyche also becomes fancifully disturbed, growing to suspect that he -- the son of a prostitute whose father, he’s convinced, was a famous police official -- is in fact a fictional creation of his prey. Such is the power of literature. “Neruda” will be screened at the New York Film Festival on October 5 and 6. It will be released theatrically by The Orchard December 16. 107 mins. In Spanish and French with English subtitles.